This will be your shared class repo! Guides, in-class labs and code samples, and other resources will live here. In the top-right corner of the page, click the Fork button. SEI-CC Now you will have a copy of the repo in your Enterprise GitHub account! In the Clone with HTTPS section, click the clipboard to copy the URL for the repository. Open Terminal and navigate to your ~/code folder - you may choose a different folder if you wish, however these instructions will assume you clone the repo into a folder named code. You can now $ cd SEI-CC-2 and check out your local copy of of the GA class repo! A repo on your computer is called a local repo ("repo" is short for repository). Repos on GitHub are called remote repos. Think of them as repos in the cloud. Note that by convention, the remote that points to the GitHub repo it was cloned from is named origin. 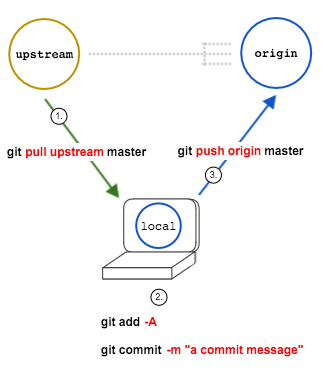 Note that by convention, the remote that points to the original GitHub repo that was forked is named upstream. Entering $ git remote -v again will show that you now have two remotes: origin (your fork of GA's class repo) and upstream (GA's class repo). Each day (maybe a few times a day), instructional materials may be pushed to the class repo by your instructors. You will want to "pull" these materials into your local repo (on your computer). Doing so will enable you to access "starter code", etc. $ git commit -m "Add amazing work..."
A merge conflict occurs when git merges two commits that have modified the same region of code and can't figure out whose code to use. Thus, fixing merge conflicts requires that a developer manually update the code to what it should be and re-commit it to resolve the conflict, which will also finish git's merge process. Git informs you which files have merge conflicts and will annotate your code to show you how your local code differs from the code being merged from the remote. An example of such annotation is below. Once you have resolved these merge conflicts by editing the code and removing the markers, you can add and commit normally. "Nested" repos are never permitted. Therefore, if you have important code, such as your projects, that belongs in its own repo, be sure to put that code in folders outside of the class repo. There are 30 required code challenges that will help you get the necessary practice of writing code, as well as teach you new methods and techniques. Just as with the class repo, you will fork & clone the code challenges repo. These coding challenges start with day 1 and will continue through week 8 (excluding project week). For your convenience, recordings of the lessons will be available to review at this link. Complete 80% of assigned "deliverables"
Support from the Outcomes Team, including participation in the Meet & Greet event (with prospective employers). Credits and discounts for other GA courses (check with Student Services for details).